Located about two hours drive from Pune, in Satara district, in Maharashtra state, on the banks of the river Krishna, it is a place where you are alone with God and you can dive into the primordial depth of the Spirit. The name Brahmapuri in the yoga sastras refers to the seat, sphere, or abode of Brahman and the Sahasrara Chakra is also referred to as Brahmapuri. In the Markandeya Purana it is described as the city of Lord Brahma, situated on the summit of golden Mount Meru, the king of mountains and the support of the planet earth in the island of Jambudwipa which is the puranic of Indian subcontinent. Also this city Brahmapuri is surrounded by the cities of Lord Indra and of seven other gods. It is also regarded that these places are subtle in nature and so their discovery is not easy. Since ancient times yogis have lived and meditated in Brahmapuri. On the left river bank one can find Bhavani Nahani – the bathing place of Bhavani Devi – and just 30 meters away from it is a very small, but vibrational temple of Shri Bhavani. Locals say that the water in this bathing place is healing, especially for the skin. Shri Sita and Shri Ram stayed in Brahmapuri during their exile when Shri Sita used Bhavani Nahani for bathing. There is a rock by the side of this Nahani called the Shri Ram Rock. Later, Shri Samarth Ramdas (who was an incarnation of Shri Hanumana) found in the deep waters of the river Krishna, stone idols of Shri Sita-Ram and Devi Anglai. Shri Mataji has Herself explained the true meaning of word, namely that Angalai (Angla + Ai) = Mother of Angla people (Anglo i.e Westerners), or Mother Mary. She further added that since their Mother (Shri Mary) has been here at this place, the Western people should come and practice Sahaja yoga here. The main temple in Brahmapuri is of Vithala-Rukhmai, and river Krishna which flows through Brahmapuri signifies the Shri Krishna Shakti. It is said that during the Mahabharata period, the five Pandavas stayed at Pateshwar, nearby Brahmapuri, did tapasya and gained powers to succeeed in their battle against evil-doers and the Kauravas. Thus Pandavas and Shri Krishna also have connection with this land. The blissful attention of Shri Mataji to Brahmapuri and Her working to find such a location manifested in the early 1970s, when Shri Mataji used to visit Rahuri. Finally the place was found and Shri Mataji came to Brahmapuri in 1984. At that time, it was a wild place, with only one simple house where the Holy Mother stayed, and the yogis stayed in the garden. Shri Mataji stayed in Brahmapuri six times between 1984 and 1990 along with the Sahaja Yogis from the West. She repeatedly stressed, “Brahmapuri is My place”. Six pujas took place at Brahmapuri and many beautiful and divine incidents are recalled by the Sahaja yogis who attended these pujas. 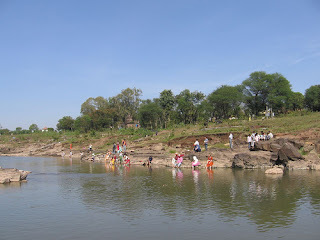 One puja was held directly in the Krishna-river. Shri Mataji was sitting on a large rock and yogis were doing puja to Her with the flowing river water. During this unique event, the atmosphere around changed and a picture of Shri Ganesha appeared on the standing rock. In December 1990, during the last visit of Shri Mataji to Brahmapuri, yogis again worshiped Her by the flowing water at the same place in the river bed. The atmosphere was such as if all Gods and Goddesses had gathered there to witness this occasion. Once, when Shri Mataji arrived in Brahmapuri late in the evening, She asked the yogis to listen to melodious sound of Krishna river water and said that was Shri Krishna Shakti singing to welcome Adi Shakti. We know that SAHAJAYOGA has reached to the level of prosperity recently. But lets have look into the past. 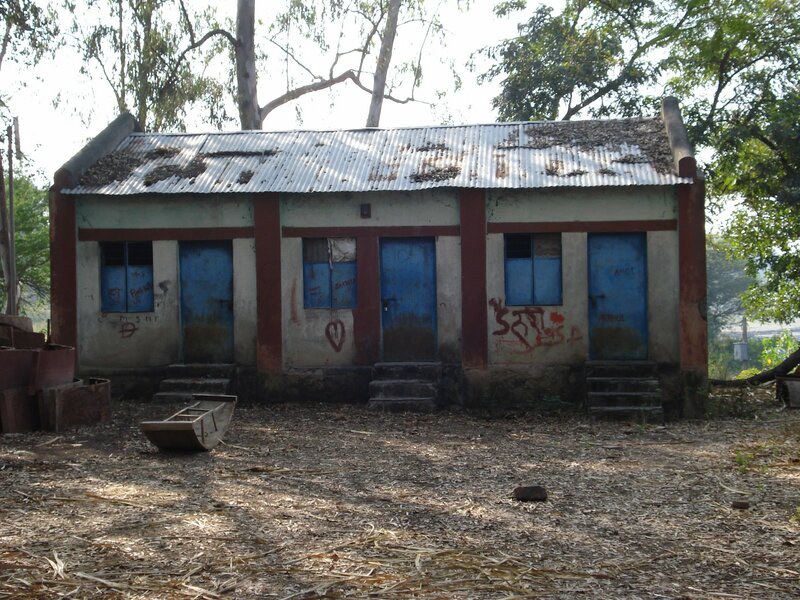 Mother use to stay at Brahamapuri in this Government built house which still doesn’t have electricity nor a proper sleeping bed. SHE has taken so much pain for us!…really only for us.